The name may originate from Malay genggang, meaning 'ajar, separate'. Alternatively, it is speculated that the fabric now known as gingham may have been made at Guingamp, a town in Brittany, France, and that the fabric may be named after the town. Some sources say that the name came into English via Dutch. When originally imported into Europe in the 17th century, gingham was a striped fabric, though now it is distinguished by its checkered pattern. From the mid-18th century, when it was being produced in the mills of Manchester, England, it started to be woven into checked or plaid patterns (often blue and white). 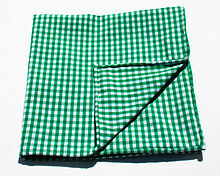 Checked gingham became more common over time, though striped gingham was still available in the late Victorian period. The equivalent in the French language is the noun vichy, from the town of Vichy in France. In the United Kingdom, the gingham pattern is often used for younger girls' school uniforms. Brigitte Bardot famously wore a pink gingham dress when she got married. This started a trend which caused a shortage of this fabric in France. Manchester United F.C. wore a gingham-pattern shirt during the 2012–13 season. Japanese girl group AKB48 used gingham as a general theme for their 2012 single "Gingham Check". Dorothy Gale wore a blue gingham dress in the Wizard of Oz book and film. Mary Ann Summers on Gilligan's Island often wore a gingham dress. Bill Hicks made reference to gingham in his famous stand-up comedy routine in regard to Jack Palance from the 1953 movie Shane. In Marty Robbins's Grammy-winning song "My Woman, My Woman, My Wife," (1970) he mentions his wife "in a dress made of gingham." ^ "Pusat Rujukan Persuratan Melayu" (in Malay). Kuala Lumpur, Malaysia: Dewan Bahasa dan Pustaka. Retrieved 11 November 2011. genggang: (génggang) sj kain yg bercorak berjalur-jalur atau dam / fabric patterned in stripes or checkers. ^ "genggang : English to Malay dictionary online - Malaycube". malaycube.com. Chisholm, Hugh, ed. (1911). "Gingham" . Encyclopædia Britannica. 12 (11th ed.). Cambridge University Press. p. 28. ^ "Did old-fashioned gingham always have checks?". Archived from the original on 2010-01-03. ^ "Manchester United 12/13 Nike Home Football Shirt". footballshirtculture.com. ^ "My Woman My Woman My Wife lyrics chords - Marty Robbins". www.classic-country-song-lyrics.com. ^ "Grammy Award Nominees 1971 - Grammy Award Winners 1971". www.awardsandshows.com.